IHHA | What Freshmen Pacers will Step Forward? What Freshmen Pacers will Step Forward? 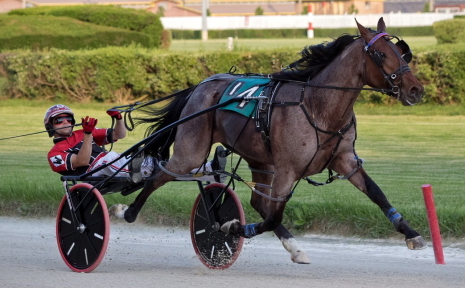 The first step to a starting berth in the Incredible Finale stake final on Hawthorne’s Night of Champions begins Friday night for Illinois conceived and foaled 2-year-old pacing colts and geldings. A victory in one of the first leg divisions of the Incredible Finale series—worth 50 series points—undoubtedly will go a long way for a youngster’s chances of gaining a shot at the estimated $100,000 purse on Hawthorne’ showcase event on September 22nd. The second race first $12,500 division matches up: The Bucket (Casey Leonard), programmed at 8-5, and Holden Steady (Kyle Wilfong), listed at 9-2, the two $30,050 Cardinal victors from the June 15th state bred stake, along with Ryan Out Loud (7-2, Mike Rogers), who motored home in 27 seconds for the Tom Simmons stable last Sunday in an Incredible Finale prep race. Meyer On Fire (5-1, Kyle Husted), from the barn of trainer Erv Miller, also figures to be a major player. The Sagebrush gelding made a costly break in his Cardinal division, but still closed in 27 flat to finish third. Sonny Sage (12-1, JD Lewis), Viola (15-1, Ryan Anderson) and Fox Valley Julius (9-1, Ridge Warren), are the other three second race starter. 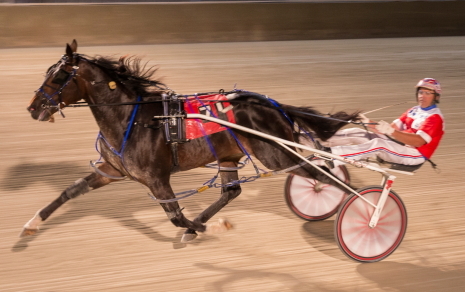 The Bucket won his Cardinal split in easy fashion by 3 1/2 lengths in 1:57.1, when he left from the pole position. This time around, he’s on the outside (post 7), looking when the gate springs open. The Bucket is another son of Sagebrush and his dam Chevie In Motion’s first foal was Chevie Winner (1:50.1), the Orange and Blue champion on Super Night 2003 for trainer Nelson Willis. The Bucket is owned by George Dremorias (Oak Lawn, Illinois), and his trainer Ken Rucker (Muncie, Indiana), formerly of Beecher, Illinois. Rucker, the leading trainer at Hawthorne during its 2007 meeting, also has a first-time starter in the second Incredible Finale division to merit your consideration. He’s Maximus and he’ll leave from post five in the eight horse field with Casey Leonard at his lines. Maximus is owned by Rucker and The Panhellenic Stable Corporation of New York. The Sportsmaster colt is out of the broodmare Theladysppealstome, making him a full brother to Fox Valley Topaz, the only Illinois bred ever to win a Breeders Crown Championship, doing so in 2008 when she raked-in $628,880. Fox Valley Topaz also was the Filly Orange and Blue on Super Night in 2008 for the Rucker stable, when she was owned by the (Marty) Engel Stable of Buffalo Grove, Illinois and Rucker who is closing in on 2,400 career winners as a trainer. The Angie Coleman Stable’s Holden Steady (Kyle Wilfong), shows his winning form in a Cardinal division earlier this month. He’s among the seven freshmen pacers going to the gate in the second race Incredible Finale series. (Four Footed Fotos). The Hawthorne program favorite is Ryan Racketeer (Ronnie Gillespie), a romping eight length winner debuting on the Carlinville half-mile fair track 10 days ago in 2:03.3. The Aaron Chandler owned and trained freshman was scratched sick last Sunday in a schedule start. Frontier Muffler (Freddie Patton Jr.), and Riley The Mooss (Gary Rath), the second and third place finishers in their Cardinal division, are listed next at 7-2 and 9-2, respectively. Maximus is at 7-1 in the track’s morning line. Cooter Luke (15-1,Tim Curtin), Sports Drama (6-1, Kyle Wilfong), Ntmycrcusntmymnkys (20-1, Jamaica Patton) and Coming Up )8-1, Steve Searle), are the other second Incredible Finale split candidates. Back-to-back Open II Paces (races 5 and 6) will follow the Incredible Finale series events. A Couple of Surprises: Thursday night’s $12,500 opening legs of the ICF 2-year-old trotting stakes saw two prohibitive favorites go down to defeat, while the two other heavy public choices didn’t disappoint their many backers. The first upset came in the initial Fox Valley Flan filly trot series, when the front-stepping 2-5 public’s choice Heidi High (Charles Arthur), was overtaken in the final yards by the Mike Rogers Stable’s E L Game On ($12.80, Kyle Wilfong) and posted a one-length victory in 2:01 flat. Another surprise came in the second Kababra stake division when the first-time starter Trixie’s Turbo ($10.20), came on in the lane and prevailed by a half-length in 2:03.2, for trainer Heather Stell. Foxvalleysrushhour had a game try to be second, while the overwhelming 1-9 favorite Prince Cassis (Casey Leonard), had to settle for third. The first Kadabra stake division went as expected when Fox Valley Picaso ($2.20, Casey Leonard), cruised to a three-plus length victory in 2:02.2 for trainer Herman Wheeler. Front Manard finished second. The second Fox Valley Flan division went to the even-money choice Encantado (Kyle Husted), in comfortable fashion for driver Kyle Husted. The Jim Eaton trainee trotted the mile in 2:01.2. Louzotic (Steve Searle), edged Loussolataire (Kyle Wilfong), for runner-up honors. Casey Leonard has four winning drives on Thursday’s card while Kyle Wilfong had a driving triple.